Off-street parking, minimum maintenance and location have been named the top three priorities of new-home buyers[i], with quality of the neighbourhood and proximity to transport links also being ranked high on the list. Eager buyers looking for a home that ticks all of these boxes should consider Notting Hill Genesis’s latest collection of houses at BEAT NW10, launching on Saturday 20th October. Presenting to the market six new three-bedroom homes situated within a popular and leafy corner of Willesden Green in north west London, buyers can satisfy all their needs with a brand-new home that comes with its own off-street parking space in a sought-after location that also boasts excellent transport links to the capital. 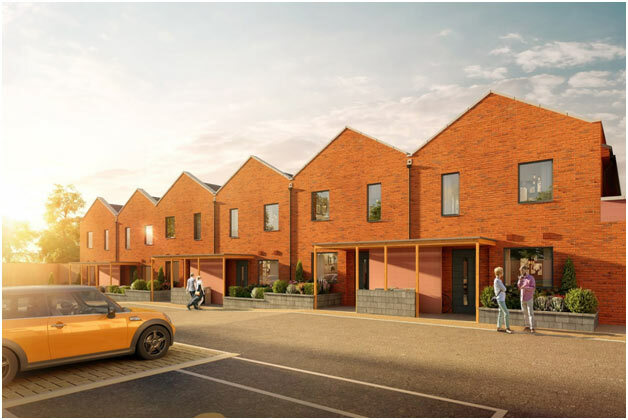 Perfect for young professional families looking to put down roots in a well-connected setting, the homes at BEAT NW10 offer a secluded and peaceful oasis away from the hustle and bustle of the city. Positioned within close proximity to a selection of good schools, local parks and is just a 10-minute walk from the buzz of Willesden High Street – buyers can be forgiven for forgetting they are residing within a Zone 2 location. With a selection of four underground stations and three overground stations within walking distance of the development, purchasers can travel across the London network with ease and enjoy uncomplicated access to a host of local amenities. Dollis Hill tube station is just over half a mile away, served by the Jubilee line. Willesden Green underground station is also only one mile away, served by both the Jubilee and Metropolitan lines, connecting residents with the West End, London Waterloo and Canary Wharf in 30 minutes or less. To reach overground services, buyers can access Kensal Green, Brondesbury Park, Harlesden and Willesden Junction stations all located under two miles away from the development. Furthermore, from 2026, Old Oak Common station, located less than one mile away, will be host to HS2, Crossrail’s Elizabeth Line and the Great Western Railway – once built it will be one of the largest rail hubs in London[ii]. All of the houses at BEAT NW10 have been beautifully designed from the inside-out, intelligently complementing the local architecture with a contemporary specification. Kitchens are fully fitted with a range of integrated appliances. Living are dining areas are light and spacious, with a profusion of natural light flooding through French doors leading to a private garden. The development is set behind private gates with phone/video entry system, safeguarding residents’ security whether at work or leisure. All of the houses also come with a private off-street parking space. Those looking to explore the local area of Willesden will also never be short of things to do. For film lovers, the Lexi Cinema is the UK’s first independent boutique digital cinema with its very own bar, making it the perfect setting for an autumn evening. Dining out at Willesden will never fail to disappoint, with a selection a selection of restaurants to choose from. Whether opting for a gourmet burger at Habaneros, or enjoying an Italian at Zanzio or La Basque, there is something for all tastes.